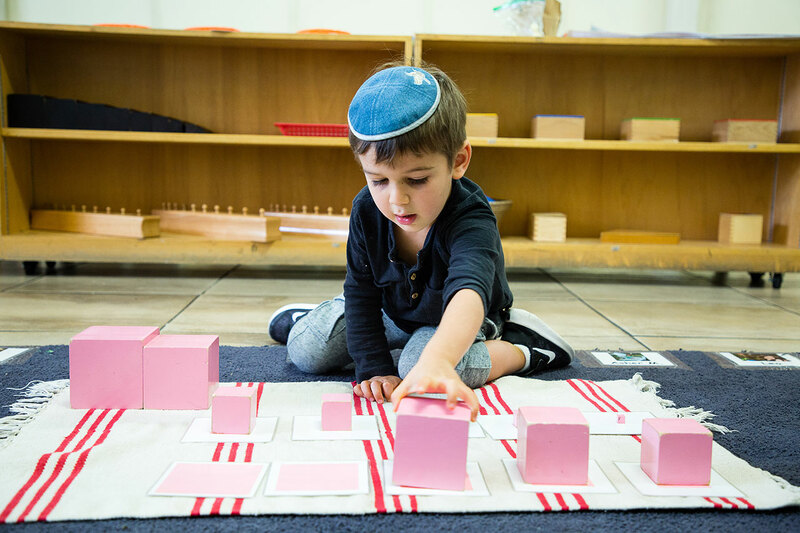 The Jewish Montessori integrates Jewish and secular subjects throughout our day, creatively intertwining various topics and themes using our hands-on materials and Montessori methods. Subjects such as weekly Parsha, the calendar cycle, Holidays, Mitzvos, Hebrew, as well as Language Arts, Mathematics, Geography, Culture, Practical Life and Sensorial concepts. Children are able to freely move around the classroom and choose activities that are naturally aligned to their curiosities and interests. This promotes self-directed learning, active decision making and a long-term love and thirst for knowledge. Our teachers give 1 on 1 lessons to each child and actively engage children in the learning process ensuring that children reach their full potential. Character development is a central focus of our daily curriculum. Middos such as Ahavas Yisroel, Derech Eretz, appreciation, empathy, joy are modeled and taught through the Montessori code of Grace and Courtesy to become respectful, responsible and contributing members of society. Our multi-age classrooms create a “mini community”. Older children serve as role models in the classroom and are encouraged to help younger children, giving lessons or helping them with a task. Younger children focus intently on the older child as they give a lesson and connect to them on a deeper level. Children who are given the freedom to interact with children of different ages build a sense of themselves, a sense of community and supports social development. It also provide a foundation for them which will help them move through life with the belief that they can try new things, and not be afraid of stepping out of their comfort zone. Through a well-rounded and child-based curriculum,The Jewish Montessori strives to educate and elevate each child’s mind, spirit and heart, aiming to educate the whole child.